Classic Acker Bilk Band Concert Posters and Memorabilia! Buy Online Now! Acker Bilk — or Mr. Acker Bilk, as he was billed — has won immortality on rock oldies radio for his surprise 1962 hit “Stranger on the Shore,” an evocative ballad featuring his heavily quavering low-register clarinet over a bank of strings. To the jazz world, though, he has a longer-running track record as one of the biggest stars of Britain’s trad jazz boom, playing in a distinctive early New Orleans manner. After learning his instrument in the British Army, Bilk joined Ken Colyer‘s trad band in 1954 before stepping out on his own in 1956. By 1960, a record of his, “Summer Set” — a pun on the name of his home county — landed on the British pop charts, and Bilk was on his way, clad in the Edwardian clothing and bowler hats that his publicist told his Paramount Jazz Band to wear. Several other British hits followed, but none bigger than “Stranger,” which Bilk wrote for his daughter Jenny. The single stayed 55 weeks on the British charts and crossed the sea to America, where it hit number one in an era when radio was open to oddball records of all idioms (Bilk gratefully called “Stranger” “my old-age pension”). Released on English Columbia in Britain, several Bilk albums came out in America on the Atco label, and he continued to have hits until the British rock invasion of 1964 made trad seem quaint. With that, Bilk moved into cabaret and continued to have some success in Europe, leading jazz bands, recording with lush string ensembles, and even scoring another hit, “Aria” (number five in Britain), in 1976. Continuing to perform through the 2000s, Bilk slackened his pace so that he could pursue, like Miles Davis, a hobby of painting. 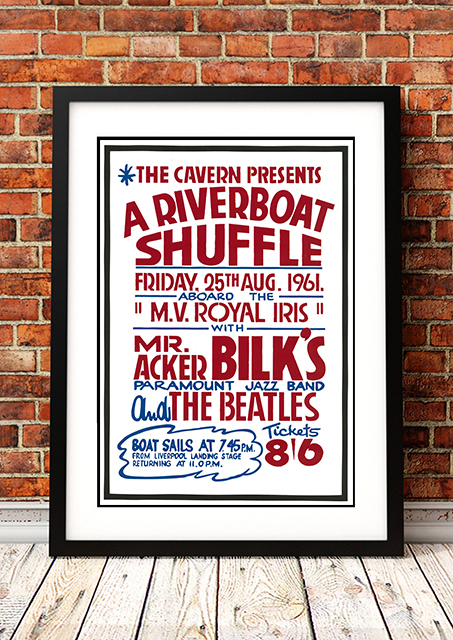 We stock an awesome Acker Bilk Band Concert Posters where the Beatles were his support from 1961.